In 1854, John Delaney & his wife Bridget Delaney (née Dunne) left Twomileborris, Co. Tipperary, Ireland, with their six young children, Patrick (13), Catherine (12) , Margaret (11), Mary (9), Ellen (3) & John (2), and landed on the 15th January 1855 in Australia . They took up 320 acres of uncleared land in Nirranda in 1866, on what later became known as "Delaney's Corner" on the Great Ocean Road. This site tells the story of how Delaney's Corner got that name - the story of how and why the Delaneys left Ireland to come to Australia and what they've been up to since they got here. Besides making whiskey, that is. And more Delaneys. Recently a video of Brigid Delaney surfaced (OK, I only just found it) discussing modern love and relationships with Annabel Crabb, a talk she gave on 12 September 2009 when her book This Restless Life was published. It's on the National Times site here. John Beasley snr is handed food by his brother in the 1952 Sun Tour. 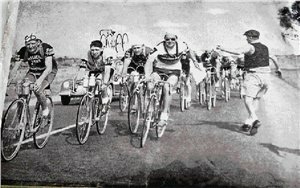 On ABC Radio on Sunday July 3rd, 2011, Alan Brough chatted with John Beasley Snr, the oldest living Australian to participate in the Tour de France, and whose mother Maria was the daughter of Whisky Tom Delaney. Still a fit bloke and now in his 80s, John has fabulous tales of being in the Tour in 1952 and 1955, riding alongside Russell Mockridge in 1955, and many other cycling highlights. You can listen to the podcast of the show below, or right-click here and choose Save As to download the podcast and listen to later. Recently an old 16mm news reportage made at the first Delaney/Dunne Reunion on 31 December 1978 was restored, converted into digital form and published on youtube. In it, an interview with one of the organisers, Joe Delaney, is followed by a silent film of the mass that day, plus the unveiling of the plaque which sits on a stone at Delaneys Corner. The Delaneys Corner book is now on line! The Delaneys in the News page has a few new additions - keep them rolling in! Due to privacy concerns, the online family tree has been changed. Read the What's New page for more details, and stay tuned for more developments! The Warrnambool Standard has published yet another article on the Delaneys. That makes quite a few now since the first in 1881. The Reunion was a great success, I can put any photos you would like to see online here. Send them in! I've put up a copy of Reunion program for the 2 days of 15-16 January. The official invitation to the fourth Delaney Family Reunion is now up. Stay tuned for further developments. The Delaneys Corner book has been printed Pre-publication book orders are recommended (no later than 30th September 2004), because only preorders plus a few more for the Reunion will be printed, so make sure you get yours in time for Christmas! There's now a page concerning the whiskey recipe book used by the Delaneys when making their whiskey. Search or browse the Delaney family tree - are you in there?. Find out a bit about the background of the Delaneys in Ireland and Australia. Check out what's new on the site. Use the links on the left to get around. The main ones are repeated at the bottom of each page. External links will open in a new browser window. Links are in green unless they've been visited then they turn blue. If you have problems with the site, contact me.